For the filling: In a medium pot, heat the milk with the grated coconut over medium-low heat until it comes to a boil. Remove from the heat and let cool until it reaches room temperature. Blend the milk and coconut mixture in a blender or food processor. Add the sugar, cornstarch, pinch of salt and egg yolks. Blend until well incorporated. Pour the mixture into the pot and heat over medium heat, stirring constantly, until the mixture thickens, about 5-8 minutes. Remove from the heat and add the coconut extract. Let it cool. For the empanada dough: In a large bowl, combine the flour and pinch of salt. Incorporate the vegetable shortening. Add the water, one tablespoon at a time, until the dough forms a ball. Divide the dough into 2 parts. Extend each part of the dough on a floured surface until it's 1/4-inch thick. Cut the dough into 4-6-inch circles. Place 2 or 3 tablespoons of coconut filling in the center of each dough circle. Fold the dough in half and seal the edges. Place the empanadas on a lightly-greased baking sheet. Bake the empanadas for 15-20 minutes or until light golden brown. Sprinkle the empanadas with sugar. Enjoy with a cup of café con leche. If you want to save some time, you can use Pillsbury™ refrigerated pie dough instead of making your own dough. 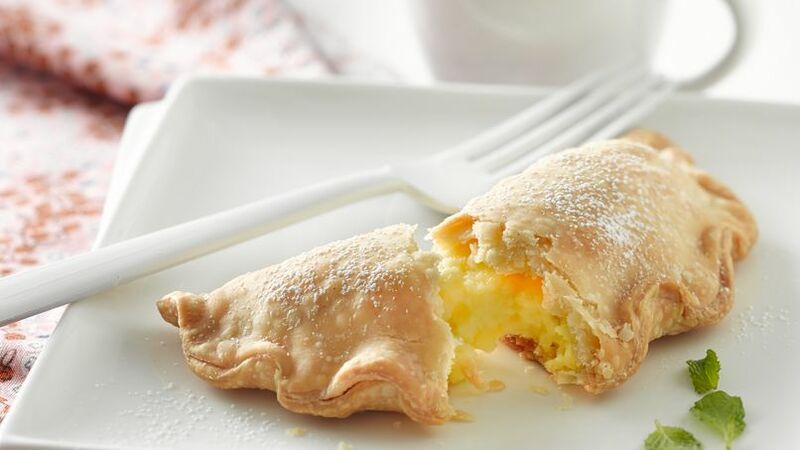 Leslie Limón On her day, treat Mom to delicious and creamy coconut empanadas.